Prepare Knorr Rice Sides - Chicken flavor according to package directions. Stir in corn, beans and chilies. Meanwhile, heat vegetable oil in 12- inch nonstick skillet over medium-high heat and cook chicken, stirring frequently, 4 minutes or until chicken is thoroughly cooked. 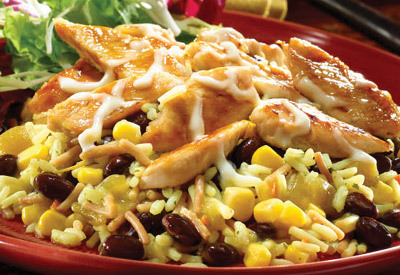 Arrange rice mixture on serving platter, then top with chicken and cheese.